If you’ve been following my adventures in peanut butter, you’ll remember that so far I have experimented with the “jam” side of the equation, in variations both savory and sweet. But for my third and final take on the classic PBJ, I wanted to do something a little more…deconstructed. A little sweeter. A little different. 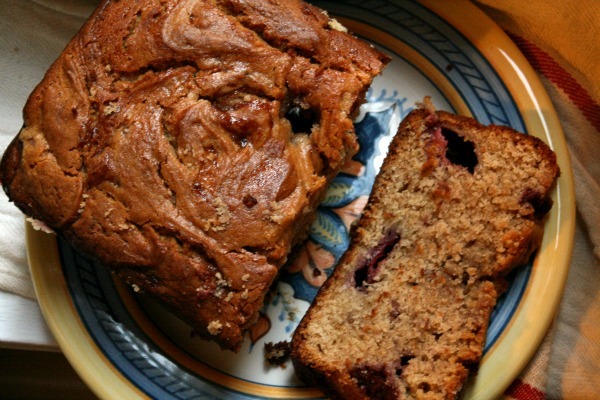 Being a die-hard banana bread fanatic, I was determined to incorporate peanut butter into a quickbread. The difficulty here is that many peanut butter baked goods end up dry and crumbly (peanut butter cookies are a prime example of this). 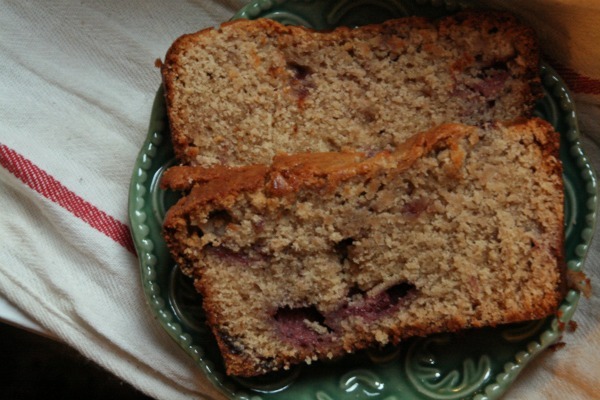 What I wanted was something dense and moist: banana bread, minus bananas, plus peanut butter. Is that so much to ask? So after much internet research and some experimentation, I bring you a quickbread that encompasses all aspects of the PB&J: peanut butter, jam, and bread. This brings the flavors of a peanut butter and jelly sandwich to life in dessert form. So you can pack this in your brown bag as a treat…or, in the ultimate expression of adulthood, just go ahead and eat it for lunch. Preheat the oven to 350°F and butter a loaf pan and line it with parchment paper. In a separate bowl, using a handheld mixer (or in the bowl of an electric mixer), cream together the butter, peanut butter, and brown sugar until light and fluffy, about 2 minutes. Beat in the egg. Beat in the buttermilk until well combined and not too liquidy. Add the flour mixture and stir just until combined (don’t overbeat). Stir in the desired amount of strawberries and half of the strawberry jam. Pour into prepared loaf pan. Dot the batter with the remaining strawberry jam, and marble it into the batter, making a swirling or zig zag pattern with a knife. Bake for about 40 minutes, or until a tester comes out clean. Don’t overbake, or it will become dry and crumbly — so you may wish to check the loaf every 5 minutes beginning at the 30 minute mark. Remove the bread from the pan and let cool. This bread looks amazing! I can finally eat a peanut-butter-sandwich-like snack without getting my mouth stuck shut! Looks like a fantastic recipe! Would you have any thoughts on how this could be adapted for a bread machine?